It’s 2016 - a year that will see you growing up to be six years old! Isn’t that fantastic? Our new year celebrations began on a bone chilling yet enthusiastic note. Do you remember you wanted to make a ‘real’ snow man? So we brought you here in the foot hills of Himalayas. Your daddy and I watched you in awe and admiration as you struggled with picking up loads of snow in your tiny hands and rolling it to give an oval shape. Your daddy joined you later but you know, he isn’t that good with rolling as well. Finally, I stepped in and added black eyes and a pointed nose to the snow man. We put the cap and muffler and your snowman was ready! 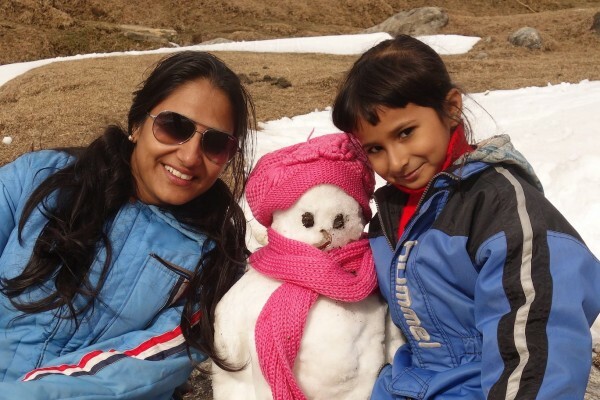 It was snowing there and we constantly worried about your health but when you made your snow man and volunteered to get a picture clicked with it, I knew we had done the right thing. You are our only child. Our only little bundle of joy, pride and innocence. But that is not why I love you this much. My love for you goes much beyond the biological reasons that bind us together. It is more profound than I can ever explain in words and show in actions. My unconditional affection towards you is deep rooted in what you have made me as a person, right from the moment you entered my heart through my womb. It wasn’t a smooth journey of nine months but it was exhilarating. You kicked me from inside vigorously and I thought you were hungry. So I hogged onto the delicious, packed food and gained over 40 pounds thinking some of it would give weight to you too. But you chose to remain slim. At the end of 34 weeks, you arrived in this world. With your sunshine face, small eyes, slender body and the softest limbs. You were tiny, tender but tireless. Fresh as a morning dew and pleasant as spring. We immediately bonded. Not over my breast milk but over our warm, snug hugs. We couldn’t get enough hugs from each other. Do you remember any of this? Since then you have been taking me on this beautiful and emotional journey of motherhood. Your smiling face adorned with those ever inquisitive eyes make my mornings brighter and your soothing, rhythmic breaths striking against my chest under a blanket make my nights cozier and warmer. They say there is no love in this world like the love of a mother. I say there is no greater joy than the pleasure of holding your baby in your arms. So true. I may have brought you into this world but you have given me a new life too. Not just the life, you have taught me the new meanings of love and life. It is because of you that my love is now patient and kind. It is not aggressive and ferocious but it is strong. It is because of you that my life now finds delight in small, little things like reading bed time stories, walking along aimlessly, jumping like crazy in muddy puddles, picking up fallen flowers, watching the birds fly and many more. You have made me patient. Gentler. Happier. More giving. Less materialistic. Slow and strong. You have given me a new reason to live. You have brought the best out of me. You make me feel beautiful, all over again, a little like your daddy when he started dating me. This year and for the many more years to come, I want to promise you that I will only love you more. My love will forever grow. In softness. In strength. In passion. In understanding. In needing less from you. In giving more to you. Many years later, when I am not there physically in this world, remember my love will still be there - watching you grow and become a lovely, elegant woman. Then, if you miss me, just tap on your heart. You will hear a heartbeat. That’s me. That is where I always reside. Inside you. Just like you live inside me, every moment of the day. Surabhi Surendra is an MBA who took up blogging to follow her interest in writing. She also quit her Business Analyst job in an MNC to settle down with her family in the remote islands of Andamans.